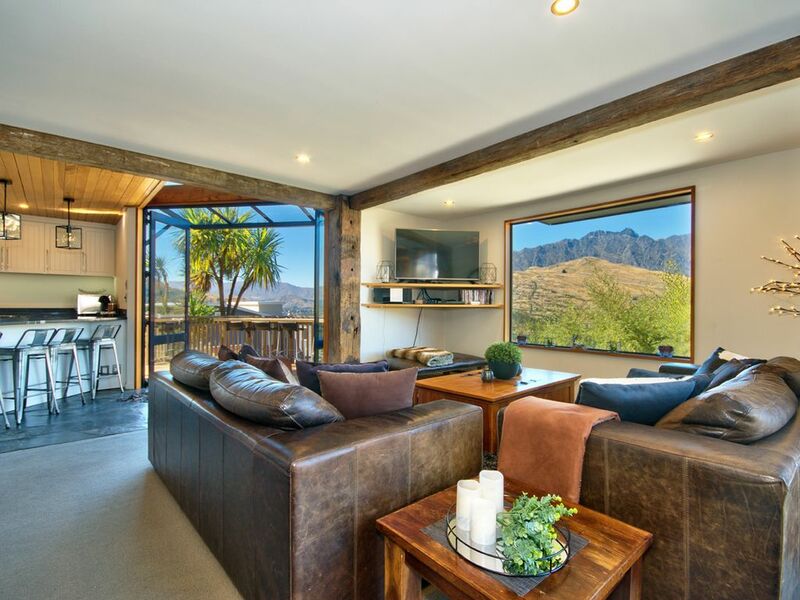 Kaiora Lodge is a three storey, three bedroom (plus second lounge with Queen sofabed), three bathroom house on the hill overlooking The Remarkables mountain range and Lake Wakatipu. The master bedroom has a window-enclosed spa bath, large flat screen TV on the wall and a genuine 'church' door. Quality leather furniture and TVs on every level with cosy wood-burner to keep you home inside and massive BBQ and outdoor seating amongst the 'palms' in the Summer. For something a little different and tasteful, halfway between Queenstown and Frankton, this is the house for you. An optional extra to hire a portable Spa Pool on the deck. Rate includes linen and housekeeping upon guest departure. Further housekeeping can be arranged. Babysitter also available by arrangement. Portable Spa Pool/Jacuzzi on the deck is an optional extra. The price ranges from $60 - $115 per day depending on 4 or 6 person spa and length of hire. If you would like us to book this for you, just let us know. Guests must be 25 yrs or older to book this property. Person booking must stay at the property. Fantastic views. Great outdoor deck area with breakfast bar and outdoor dining table - perfect for those summer evenings. Some extra pantry items are supplied. Guests free to use. Owner asks if you use the last of something please replace it. Fully Equipped kitchen. Cutlery drawer is inside the top drawer near coffee machine - there is an extra drawer inside. There is no Hot Tub (Spa) at this property but you can hire one at guests own expense - we can arrange this for you. Lovely property and great location. We had a wonderful stay. Great house with open rooms and full equipped and great view. Great house with open rooms and full equipped and great view. Thanks a lot. Kaiora Lodge was very well equipped with everything you could possibly need for a snow trip. Kaiora Lodge was very well equipped with everything you could possibly need for a snow trip. The house was super warm, and the three bathrooms, particularly the ensuite in the loft, were perfect. The underfloor heating was definitely appreciated. Amazing views. Comfy beds. No complaints at all. Could have stayed for another week! Fantastic house with stunning views from every room. Fantastic house with stunning views from every room. Will definitely visit again. Great location, fabulous views. Good option for a family with older children or couples. Nice walk to town with access to the Queenstown Lake Front Trail not far. Everything was comfortable and well equipped for those who like to self cater whilst on holiday.